Rogozin, who previously served as deputy prime minister, is one of a number of high-ranking Russian officials under U.S. sanctions over the nation’s invasion and annexation of part of Ukraine. He requires a waiver to travel to the United States. The decision came amid growing criticism from Capitol Hill of the Trump Administration’s decision to grant Rogozin permission to visit. 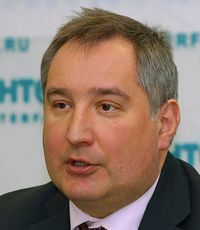 As Deputy Prime Minister of the Russian Federation at the time, Mr. Rogozin was sanctioned for his actions contributing to the Russian government attack on Ukraine. In solidarity, the European Union also sanctioned Mr. Rogozin for his actions and reportedly denied him entry into the EU on two separate occasions. As far as I know, Mr. Rogozin has done nothing since that time that would justify removal from the SDN list by the Treasury Department. In the event that the administration waives the visa ban and allows Mr. Rogozin to travel to the United States, I plan to introduce a resolution of disapproval of such action under the Russia Review Act title of the Countering America’s Adversaries Through Sanctions Act (PL 115-44). Given Mr. Rogozin’s egregious behavior over the years, I would expect that such a resolution would pass with broad bipartisan support. The decision to postpone the visit will presumably head off Congressional action for the time being. This is stupid. CONgress should not interfere with the space program. Capt. Oler, your Trumpian use of insulting nicknames is tiring. LOL. You mean like money? Which one. Inviting or not. Government shutdown. No decisions today.